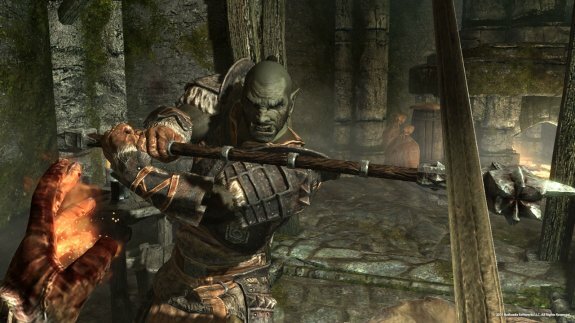 Bethesda's new update for The Elder Scrolls V: Skyrim may have fixed some problems but it also introduced a bunch of new issues. PC players complain on online forums that patch 1.2 causes performance issues and in some cases makes it impossible to start the game. Other bugs include dragons flying backwards, magic resistance no longer working, enchanted items losing their power, shouts malfunctioning, new quest problems, etc. - Shouts stop working, and upon trying to switch to a different one game tells player they are already shouting. - Issues with placing and removing weapons from weapon racks and cases. - Getting a LOT of reports of overall decrease in graphics. Now I haven’t noticed myself, but I’m seeing a lot of reports of it, so I figured it should go on here. - Learning Shouts out of order is causing them to bug out for some people. - The dark brotherhood cowl does not show a face mask, only seems to work for females (Astrid or Initiate) but doesn’t show up for males. There’s a regular version and a maskless version, and they both have no mask and look the same. - Lydia cannot be married despite the fact that she should be able to be. - Many Different quest items not being properly removed from inventory after completing quests (Rjorn’s Drum, Pantea’s Flute, an Orichalcum Ore, and the Glenmoril Witches heads, Finns Lute – just to name a few. - Can’t complete the Thane of Riften misc quest. The misc quest states I need to speak to the Jarl, but the Jarl has no dialog option for completing the quest. I was getting the dialog option to complete prior to buying a house in Riften. When I bought the house, the option disappeared. - NUMEROUS problems with the Blood on Ice quest.